Hastings United will be away to Harrow Borough in FA Cup fourth round qualifying if they win their rearranged clash away to Margate. Hastings United's footballers will be on their travels yet again in the FA Cup - if they get through to the next stage. The winners of United's third round qualifying tie away to Margate will head to Harrow Borough following this lunchtime's (Monday's) fourth round qualifying draw, which was made live on talkSPORT radio. United will travel to Margate for a second time tomorrow night after the original meeting on Saturday was called-off by the match referee because of a waterlogged pitch following heavy rain. In fact, it was the only third round qualifying tie in the country to be postponed. 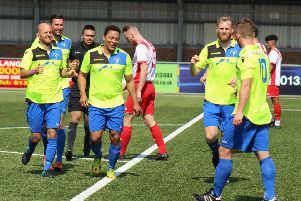 Harrow, incidentally, are 19th in the Ryman Football League Premier Division, which is one level above Division One South club United and one below National League South outfit Margate. All three matches United have played in the FA Cup so far this season have been away from home (it will be four after they've played Margate) and their last game in any competition on home soil was back on September 10. As for the other Sussex clubs in fourth round qualifying, Burgess Hill Town are at home to National League outfit Dover Athletic, Whitehawk will travel to Welling United and Eastbourne Borough will head to Aldershot Town if they win their replay away to Hadley. The fourth round qualifying ties will be played on Saturday October 15 and the winners will join the League One and Two clubs in the first round proper.